Congratulations first to everyone involved in Storyhouse in Chester. This is the redevelopment of the old Odeon cinema in the town centre into a new theatre, and cinema, and – this combination making the building’s name just about the most perfect imaginable – library. The building opened in early May with no big hoopla, no spectacular launch event. It felt like they just opened the doors and the people of Chester came, delighted to find an oasis in the desert created by the demise of the Gateway Theatre a decade ago. While the public explored the building, we teched the first two shows of the opening four-show rep season, enjoying an auditorium of 500 seats across two levels wrapped around a thrust stage that is delightfully intimate yet also easily capable of telling big tales. 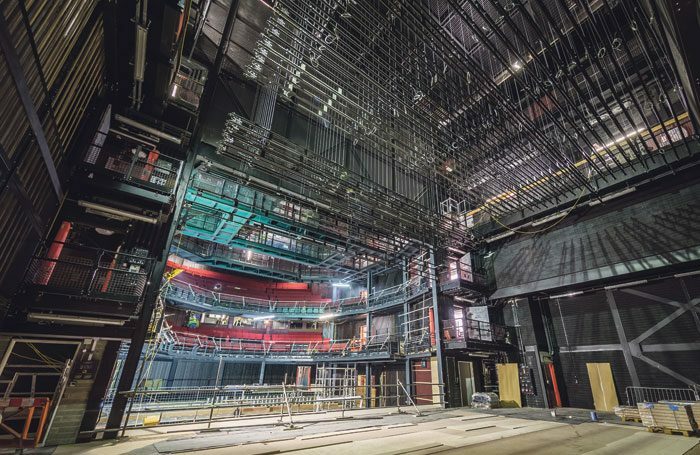 Unless you knew, there really was nothing to give away that this same space can also be a three-level, 800-seat auditorium with a standard proscenium stage – as it will be when receiving touring shows rather than presenting Storyhouse’s own work – so carefully have the teams from architects Bennetts Associates, consultants Charcoalblue and all who built the place done their work. So, congratulations to them, to artistic director Alex Clifton, chief executive Andrew Bentley, project director Graham Lister and everyone now working in the theatre and on the shows. It was a privilege and a pleasure to be a small part of it all. As it was to be part of Showlight, the lighting symposium held every four years, each time in a different city, which this year landed in Florence. In a world where it’s very easy for discussion about lighting to become about technology (because that’s easier to talk about) and money (because you need to figure out how to pay for that technology), Showlight has always been a welcome breath of fresh air, a conversation about the art and craft itself. At its heart, it’s a series of papers, each limited to 20 minutes, given by lighting practitioners talking about their work. This year, they ranged from lighting tiny puppets and zoos to lighting Bruce Springsteen, but it also included delightful moments such as Amy Mae Smith, who lit the recent Sweeney Todd in a pie shop, being asked about her work by Ken Billington, who lit the very first production. Wrapped around that were fascinating tours of the host city and some great meals among great company. Congratulations to all involved in organising it, led by chairman John Allen. Never been? You should go. If it seems expensive, find a subject to talk about so you don’t have to pay the admission fee. The next one will be in 2021. They don’t know where yet… though I hear there is a rather lovely new theatre in Chester. Mark Shenton: Which musical will be victorious in Broadway’s bumper year?